A GLIMPSE OF THE PAST - OLD PHOTOS OF THE HÖFNER FACTORY & WORKSHOPS. 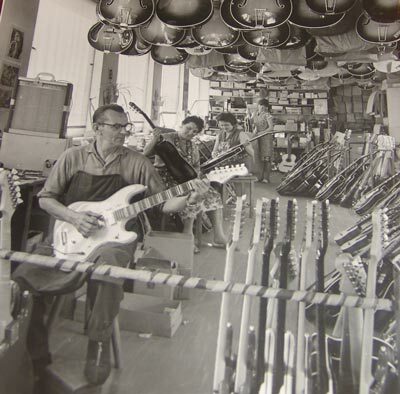 The following photos have been obtained from various sources, including old catalogues, personal albums, and from Höfner themselves. Hopefully they will give a good idea of how Höfner was operating in the "glory days" of the 1960's, as well as the following decades. What has struck me when studying them is the similarity between the production process then and now! Maybe the ladies don't wear floral pinafores any more, and some of the male luthiers now tend to wear trainers rather than felt zip-up slippers! However, the appearance of the inside of the Höfner factory these days looks very much as it always has done. You can see photos inside 21st Century Höfner Hagenau by clicking HERE.